Here’s a nice item – that could be a collector’s piece of the future. 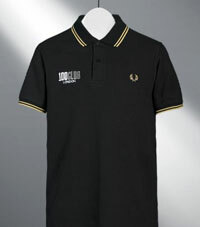 Fred Perry has released a limited edition run of slim-fit Fred Perry polo shirts featuring the 100 Club logo. There’s very little else you can say – everyone know what the top looks like, it’s an iconic item. Made from 100% cotton, the limited top is available in both black and burgundy in sizes small to extra large, both with collar and sleeve trim and sells for £60. uhhmmm…not sure because of the tiny picture, but…gold stripes and gold fp logo with white 100club is an uncool clash of colours. i work in a fred perry outlet store and we were selling that t-shirt for £27!! !